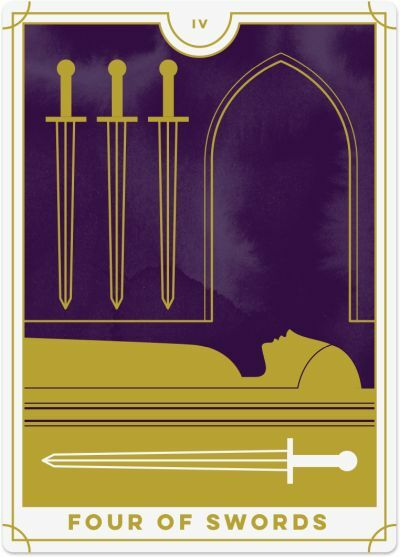 The Four of Swords shows a knight lying horizontally on a tomb. He remains in his full armour, and his hands are in the position of prayer as a sign of rest. One sword lies beneath the knight, symbolising a single point of focus, and three swords hang above him, pointing downwards towards his head and torso. The stained-glass window above him shows a woman and child together. NOTE: The Tarot card meaning description is based on the Rider Waite cards. 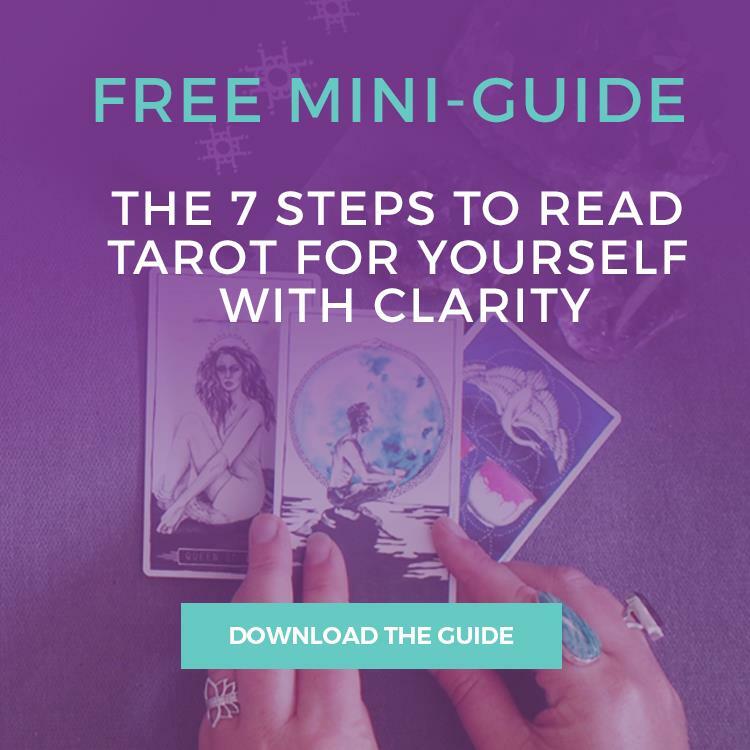 Download this free PDF resource to discover how to create accurate and insightful Tarot readings every time you consult the Tarot cards! The Four of Swords tells you to rest before you take on the next challenge. You have reached an important first milestone and must recharge your energy before the next phase begins so you are refreshed and ready to go. Even if you are highly productive and driven, take time out from your busy schedule to restore your energy and heal the body and the mind. Constant stress and tension will break even the hardest and most resilient of people but brief periods of rest enable you to refresh your energy, concentration and focus so that you are ready for the next challenge. If you have been going through tough times recently, such as the trauma of break-up or departure, relationship or family problems, financial and health worries, stress or conflict, then the Four of Swords comes as a sign to take a step back and regain perspective. Take a day off work, travel to a new destination, or spend time with your loved ones – whatever you need to take a break. Now is not the time to make decisions. In fact, the Four of Swords presents a new challenge: to stay silent and inactive. Now is the time to build up your mental strength by clearing your mind of any mental ‘clutter’ or stress. Meditate and spend time in a place that creates peace, calm and tranquillity for you. Go on retreat or start a meditation course. You need to replenish your strength and spend time connecting with your Higher Self. The Four of Swords suggests the need for seclusion. You need solitude to negotiate your situation and time apart from others to gather your thoughts and feelings. Following on from the painful loss of the Three of Swords, this Four suggests your need to spend time alone to re-evaluate your life. Solitude, although often difficult to bear, is necessary for you to recharge your batteries and rejuvenate your spirit. This solitary experience always bears fruit in greater inner strength and confidence. Retreat from pain, conflict and distractions, and rid yourself of stress and anxiety. Ground and re-charge yourself. Look inward for a real change and meditate daily. In a practical sense, the Four of Swords is an indicator that you need to take some time to review your progress so far. This is an excellent time to re-assess your priorities. It is almost like conducting your own ‘post-implementation review’ following a major milestone or a significant challenge. Create time and space to evaluate what has worked well, what has not, and what you need to change. Pausing to reflect after each major challenge will position you well for success in the future. The Four of Swords reversed sends a powerful message that you need to take time out to rest and recharge your energy. You may be working long hours, giving your time and energy to others in need, or involved in a highly stressful and demanding undertaking. You are close to exhaustion, and your energy reserves are running low or on empty. If you do not stop and take some much-needed rest now, you may crash and burn-out completely, rendering yourself completely ineffective and unable to help anyone. The reversed Four of Swords is calling you to withdraw from your external world, and retreat within. Now is time for a social media detox, a weekend escape, or a silent retreat so that you can focus your energy within and find your peace once again. Use daily meditation to calm your mind. The Four of Swords reversed can show that you are restless and wanting to do everything at once. Even if your body is telling you that you need to rest and relax, your mind may push you forward, trying to carry out a long list of tasks and making you sick or stressed as a result. So it is vital that you force yourself to take it easy to make sure you do not run yourself into the ground. Some ‘busy time’ is OK but be careful not to push it so far that you end up hurting your health and well-being. If you need to rest, rest. Even just a quick ‘nanna nap’ on the weekend or a twenty-minute meditation each day can help to re-balance your energy reserves and get you ready for even more productivity. The Four of Swords reversed can also represent stagnation and a lack of action leading to increased frustration. For example, a long-term marriage has become spiritually and emotionally empty. You may need to take a break and come back to it when the energy is flowing better. Similarly, the Four of Swords reversed suggests that you are frustrated with the lack of progress and change in your life. Part of this lack of change may be due to your passive approach. There may have been situations that were frustrating to you or that you were unhappy with but you chose to wait it out and hope that they would eventually change. Now you're feeling the ramifications of that choice. Privacy and Terms. © 2019 Biddy Tarot. All Rights Reserved. All prices in USD. Tarot card images courtesy of the Everyday Tarot, The Wild Unknown and Lumina Tarot.